A finalist for the 2016 Cybil’s award, this story is about the journey a grandfather takes with his grandson to understand the life and heroism of Lakota Indian leader, Crazy Horse. It begins in South Dakota and moves into Nebraska, Wyoming and Montana. Each stop is another place where Crazy Horse left a part of his heritage. Landscapes, monuments, and landmarks trigger each part of his story. There is a reason for the trip as Jimmy, the grandson, has been bullied for the way he looks (too white) and he doesn’t have the courage to stand up to his tormentors. This sub-plot occurs at the beginning and end, but otherwise Jimmy is in learning mode the entire way. He says “Wow” a lot as he soaks up the story along with the rest of us. Most of the book is a recounting of the struggles and decisions Crazy Horse made to save his people from the intrusion of the white man, or Long Knives as they are known. This would make a great companion source in a history class as Crazy Horse’s plight has never been so clearly stated. If all you’ve heard about is Little Big Horn, then you’ll be in for quite a learning experience as you wrap yourself around the story with compassion and understanding. FULL PLOT (From AMAZON) Jimmy McClean is a Lakota boy—though you wouldn’t guess it by his name: his father is part white and part Lakota, and his mother is Lakota. When he embarks on a journey with his grandfather, Nyles High Eagle, he learns more and more about his Lakota heritage—in particular, the story of Crazy Horse, one of the most important figures in Lakota and American history. Drawing references and inspiration from the oral stories of the Lakota tradition, celebrated author Joseph Marshall III juxtaposes the contemporary story of Jimmy with an insider’s perspective on the life of Tasunke Witko, better known as Crazy Horse (c. 1840–1877). The book follows the heroic deeds of the Lakota leader who took up arms against the US federal government to fight against encroachments on the territories and way of life of the Lakota people, including leading a war party to victory at the Battle of the Little Bighorn. Along with Sitting Bull, Crazy Horse was the last of the Lakota to surrender his people to the US army. Through his grandfather’s tales about the famous warrior, Jimmy learns more about his Lakota heritage and, ultimately, himself. A handy map appears before the story begins tracing the route Jimmy takes with his grandfather. You’ll be wanting to visit some of the same sites. An extensive 16 page glossary covers all the words and Indian names young readers may not be familiar with. A great source to even read ahead of time. I came away with a reminder that in war there are no winners–everyone loses something. This is a unique book that shows diversity in a different way than most MG stories. The connection you can make with your own culture by listening to family members who have a few more miles under their belts. Jimmy understood what she meant, but it didn’t make him feel any better. It was the main reason Corky and Jesse teased him. “You’re just an Indian pretending to be white” was what Corky liked to say. 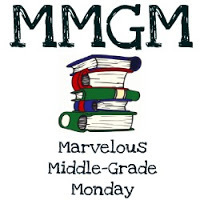 This entry was posted in Reviews and tagged In The Footsteps of Crazy Horse, Joseph Marshall III, male protagonists, Marvelous Middle Grade Monday, MG book reviews, Middle grade. Bookmark the permalink. I’ll bet this will be really popular with middle-grade boys. I hope it get bread readership. We could all stand to learn more of this kind of history. Thanks for the heads up.